Beginning with version 4.41.83 a password can be locked so that users who want to view or use it must enter a reason. When someone enters this reason, an email message is sent to its password manager. Since version 7.79.190 locked passwords can optionally be unlocked only with the permission of the password manager. Since version 7.80.192 locked passwords can optionally be unlocked only with the permission of the password manager or all the users who have manage permission on the password. Note: when a user locks a password, it will be unlocked for her for the remainder of her session. Any user with access to the password who wants to view or use it will have to unlock it by entering a reason. Note that here unlock means "unlock for the remainder of the session". 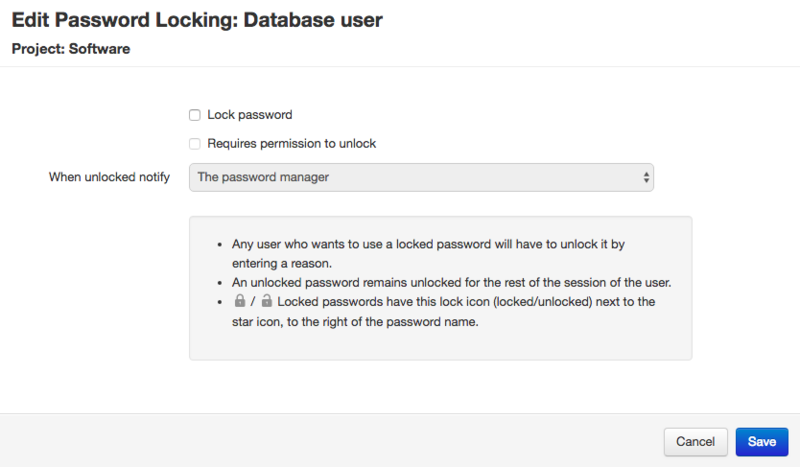 The password will still have a locked status, but for the user who has entered a reason it will appear as unlocked. The unlocking will be logged with the action "Unlock password" and the reason in the "Additional data" field. 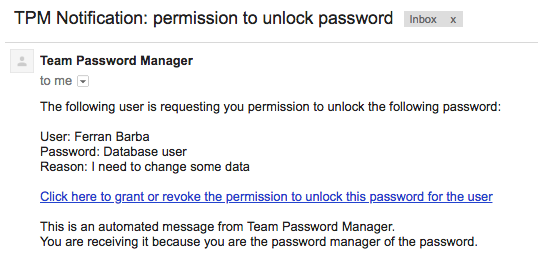 An email notification will be sent to the password manager with the entered reason. Since v. 7.80.192 this notification will be sent to all the users with manage permission if when configuring locking it's specified so. Remember that an unlocked password remains unlocked for the rest of the session of the user. If you want to permanently unlock it for everyone you'll have to click on the "Locking" button and uncheck the "Lock password" checkbox. Request permission to "The password manager". Request permission to "All the users with manage permission on the password". Request permission to "The password manager"
When the requester clicks on "Click here to unlock the password and access it", the password will be unlocked and the user will be able to access it (for the remainder of the session). 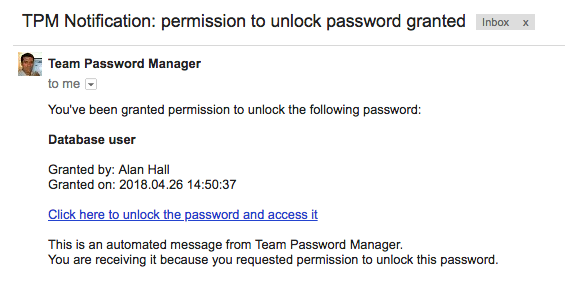 Also, an email will be sent to the password manager notifying that the requester has unlocked the password. If, on the other hand, the password manager revokes permission to unlock the password, an email will be sent to the requester notifying him/her of this decision, and he/she will not be able to unlock the password. If the user requesting permission to unlock is the password manager, it makes no sense to send messages back and forth and grant/revoke permissions. In this case, the user will just have to enter the reason to unlock the password. If the password manager is not valid (where here valid means that the manager exists, with a role that is not Read only, not API only and active), permission will be sent to the password's project project manager. If the project manager is not valid either, a message informing of this will be shown. Admin users do also have to enter the reason to unlock a password or request permission to unlock to the password manager. Request permission to "All the users with manage permission on the password"
If a locked password is configured as "Request permission to All the users with manage permission on the password", the process is the same as the "Request permission to The password manager" one, except that in this case the request is sent to multiple recipients: any user with manage permission on the password. In this case, even the main password manager needs to request access. Before V6.x, the export procedure is not affected by the locking state of a password. That is, locked passwords will be exported as if they weren't locked. In V6.x locked passwords are only exported its name and project name. Also, you can't define a password as locked using the import function. You have to import it first and then lock it using the "Locking" button as explained before or using the API. Locking/unlocking a password can be done using the API (PUT /passwords/ID/lock.json and PUT /passwords/ID/unlock.json). To view or use a locked password, a special header called "X-Unlock-Reason" must be supplied with a reason. Those methods that do not supply "X-Unlock-Reason" will fail with Forbidden or, if showing a password, only the name and project will be returned. Please refer to the specific methods in the docs to see each case. API v1 has no support for locking. Locked passwords are only shown the name and project and no operation can be done on them. Locked passwords that are permission based cannot be used with the API. In this case if the "X-Unlock-Reason" header is supplied a "409 Conflict" error with the message "Cannot unlock a password that requires permission to unlock" will be returned. Locked passwords that are permission based can only be accessed (any operation) by the main password manager, entering a reason. Other users cannot access the password using the API. In this case if the "X-Unlock-Reason" header is supplied a "409 Conflict" error with the message "Cannot unlock a password that requires permission to unlock" will be returned.